In a relatively young country like the United States, there is often a tendency to think that the “old-fashioned” way is always better than modern methods. This is a common belief when it comes to the use of stone mills to crush olives during the olive oil extraction process. Many consumers and some producers are convinced that using a stone mill to crush the olives, as opposed to modern, metal crushers, is "better". Stone mills use rollers or wheels, rolled in circles on a slab of granite, to grind the olives into a paste. 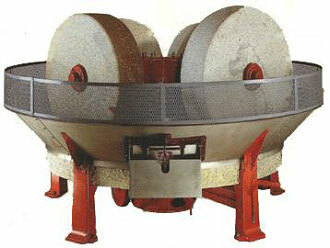 Mills are sold in different configurations, with two, three, or even four stones. The fact is that using stone mills to crush olives does not yield better results, just different ones. Like most things, stone mill processing has some disadvantages and some advantages. Using a traditional stone mill to make olive oil has several disadvantages. First, it is a discontinuous, labor-intensive process, especially in the case of green olives (unripe) that prolong grinding time. Second, stone mills are hard to clean, which costs time and money, and may result in off flavors in the oil. Third, there is more exposure to oxygen, which results in oil with less antioxidants. It is therefore less healthy and will have a shorter shelf life. Fourth, stone mills take more room in a processing facility and are less flexible than modern crushers in terms of possible adjustments to accommodate different milling conditions. Finally, stone mills are expensive. On the other hand, there are some pluses to using a stone mill. First of all, stone mills provide romantic imagery and offer a great tourist attraction. Some milling facilities use a stone mill in the public part of their building, and modern equipment behind the scenes; or use stone mills which are combined with a crusher, called a finisher, to make them more efficient. A related advantage is that, in the United States, being able to say that an oil was made with a stone mill, the “old-fashioned” way, is a great marketing tool. Another important advantage is that oil produced by stone mills is generally milder and more buttery-tasting, which some consumers, especially those who are new to the olive oil world, tend to prefer. Part of this softer taste profile is due to the fact that they contain less antioxidants. Another reason is that milling stones do not pulverize the olive skin, as some older model metal crushers do, so less chlorophyll is released -- in some cases, this is a enough of a disadvantage that some producers add leaves with the olives to get a more grassy taste. As “old-world” styles meet “new world” equipment, the newest generations of metal crushers are becoming much more gentle and capable of producing outstanding oils, far less bitter than their older counterparts. In Europe, and increasingly in the United States (except for the value of marketing imagery), stone mills are going extinct. It is sad from a romantic point of view, but because the newest generation of crushers produce excellent, healthier, cheaper extra virgin olive oils with a longer shelf life, it is a positive evolution in many ways.